In the very beginning, the injury caused by a spider bite resembles the bite of any insect. It is very easy to confuse it with a mosquito bite, a deer fly, or even with a thorn puncture. The proper way to dismiss any doubt is to grab a magnifying glass and examine the wound closely. A spider bite is not seen as a single mark but as two parallel fang punctures, one next to the other. If this were the case, you should explore our section concerning bite treatments. 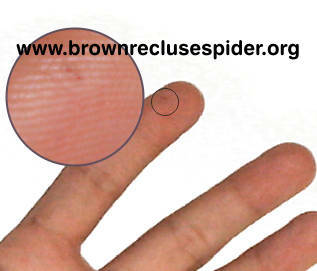 Notice that a Spider Bite does not differ from one arachnid to the other. You will probably feel no pain when the spider bites you, a fact that tends to make people unaware of the actual place where the bite occurred. You only realize you were bitten by a spider when the first symptoms appear. You may find it useful to read the article describing these symptoms, just to know what to expect. Browse the links in the navigation menu for specific spider bite aspects.